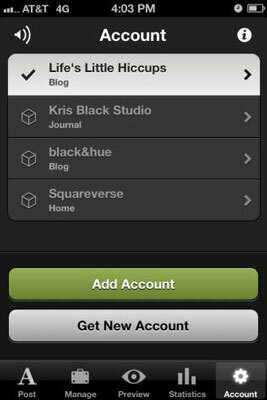 After you add an account to the Squarespace app, you can configure it as you see fit. If you’ve added more than one account, you can configure each one differently. To begin the configuration process, tap the app icon on your mobile device if the app isn’t already open. If you don’t see your account screen when the app opens, tap the Account (gear) icon to go to that screen. 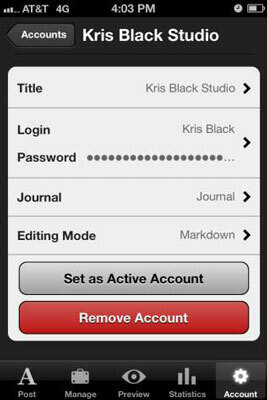 Tap your account name to load the configuration settings for your account. Title: By default, the title is set to the site title you added when signing up for the account. You can change the title. Try a shorter title that is more readable on the smaller screen of your mobile device. Login and Password: If you change your account name or password in your nonmobile account, you must make the same change to your mobile account. Otherwise, your Squarespace app can’t stay connected to your site. Journal: If you have more than one blog page module on your site, make sure this setting is connecting to the blog page to which you want to post. To post to a different blog page later, simply change this setting. Editing Mode: The default editing mode is Text, which is the equivalent of WYSIWYG editing mode on your nonmobile site. Your other two options are HTML and Markdown. Editing modes can be changed on-the-fly when you’re creating or modifying a blog post in the app. On the entry screen of your mobile device, choose your editing mode by tapping the A (text), <> (HTML), or # (markdown) icon. Set as Active Account: If you have more than one Squarespace account added to your app, you will see the Set as Active Account button at the bottom of the Account settings screen. Tap this button to set that account as the active account the app uses. You can quickly see which account is the active account on your device because a check mark appears to the left of its name on the Account screen, and the account will be highlighted and displayed at the top of the list. Remove Account: Tap this button to remove the account from your device. Because Squarespace is a hosted service on the Squarespace servers, removing your account from your device will not delete anything from your website. However, if you have any blog posts saved as drafts on your mobile device, those entries will be permanently deleted if you remove the account.